Medical marijuana patients are using CBD-rich cannabis for a wide variety of conditions, including serious and incurable diseases, and conditions that may respond poorly to FDA-approved pharmaceuticals. Over 12% are using it to address the side effects of cancer treatment. Patients with psychiatric illnesses, mood disorders, neurological diseases and CNS injuries favor CBD-dominant cannabis medicines. Patients with pain and inflammation favor CBD-rich cannabis medicines with more equal levels of CBD and THC. THC matters. Patients using the 4:1 CBD-to-THC were the most likely to report a reduction in pain and inflammation, and improvements in mood and energy. Patients using the 2:1 CBD-to-THC ratio reported the greatest improvement in overall wellbeing. This finding is consistent with scientific research indicating that CBD and THC interact synergistically to enhance one another’s therapeutic effect. CBD-rich cannabis appears to be remarkably good at ameliorating pain (particularly in patients with fibromyalgia, headaches and migraines), and at improving patients’ sense of wellbeing, particularly for patients with PTSD. Given that people using CBD-rich cannabis for “general wellbeing” are the only group who reported a decreased feeling of wellbeing and the most likely to report a worsening mood, it’s possible that CBD products may not be appropriate as a supplement for people who are otherwise healthy. 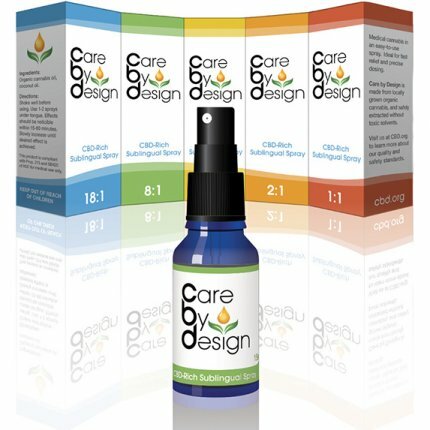 Project CBD director Martin A. Lee served as a product development consultant for Care By Design. He did not participate in the preparation of this report.